Creet’tho labored over the small dunes that had already begun forming against the side of the cruiser. He felt a pang of sadness, knowing the ship would soon become yet another forgotten crypt lost to the desert; a ghost of a once proud vessel. It had been nearly an hour since they left the outpost, and night was almost completely upon them. The darkness would not hamper their search, as the Gaalsien had long ago begun incorporating infrared night vision technology into their masks. “Let’s see if we’re able to get inside before we start searching, in case we need to take shelter quickly” Creet’tho said as he gazed upwards at the cruiser. The ship lay at a shallow angle, it’s port side buried in the sand. “Is there a crew or maintenance entryway in the stern, or on the starboard side?” Creet’tho asked his charge, turning to look over his shoulder. She was also looking up, holding her oversized mask with both hands to prevent it from slipping forward. In response to his question, she pointed upwards. Looking up to where she was indicated, he saw that the sand had caused a section of the hull at the top of the vessel to collapse. “I’ll go up and take a look” he said without turning around “don’t try to get up while I’m gone, just sit and rest”. Without waiting for a reply, he began ascending the dune at an angle, to allow his sandshoes maximum purchase while minimizing the chance of causing a collapse that could envelop him. Despite the incline, without the weight of the sled the exertion didn’t faze him, and he soon crested the dune and stepped onto the uppermost section of the Khaaneph cruiser. The exterior was very similar to it’s Gaalsien counterpart, but with a few distinct differences. Large plated sections hung off the bow and wrapped around the sides of the forward port and starboard hover generators. The interior manufacturing area, from what Creet’tho was able to see, was also relatively familiar. The Khaaneph had clearly based the design on the one employed by the Gaalsien, probably modeled upon craft they’d captured from his Kiith. 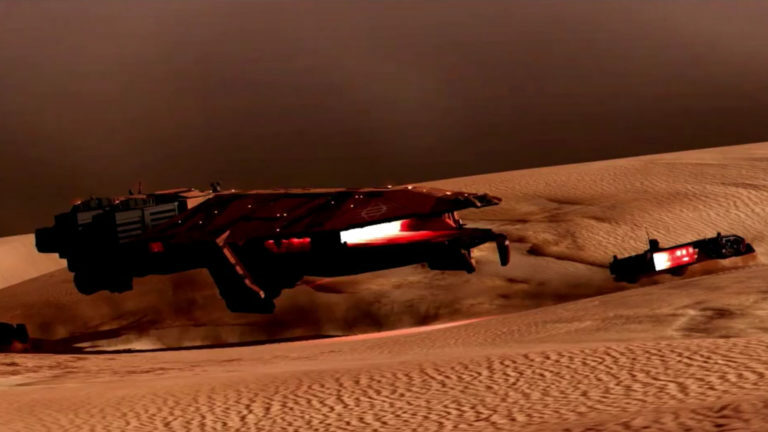 Undoubtedly the Khaaneph had also salvaged he desert wrecks, utilizing the equipment and technology obtained therein. Those wrecks were remnants of the wrath of Sajuuk when he smited the Kharakii people for violating one of His principle tenants. Creet’tho was again reminded that the heretics were again attempting such blasphemy. Surely they understood the consequences! No, Creet’tho reminded himself; the heretics twisted the interpretation of the Maker and did not believe that violating the prohibition against space travel was their reason for being on Kharak. Perhaps not residing in the Great Banded Desert and not seeing first hand the results of that defiance had caused the other Kiithiid to develop a warped theological viewpoint. Warped as it may be, those misguided people still followed Sajuuk, still worshipped He Who Shapes What Is. Unlike the Godless. How could such a thing be? How could a being not worship that which created it? Creet’tho had contemplated such things in the past, but was wary about this train of thought. Perhaps to comprehend the Godless would mean to descend to their level of madness. Shaking his head, Creet’tho focused his mind on the present, and slowly started down into the giant manufacturing area. The sand sloped downwards gently and allowed him easy access into the dark, silent wreck. It was yet another metal tomb, lost among an endless sea of sand. Or would be soon, but not before Creet’tho obtained as much information as he could for his people. I watch Creet’tho climb the sand dune to acess the cruiser. He is old, older than almost all Khaaneph. He is strong from lots of food, and he has good equipment. The Gaalsien people have so much. They have been one people far longer than the Khaaneph, working together for centuries. They’ve built a vast empire in the Kho’Rhiim. It is impressive. All Gaalsien, working together without a Rak’Shiir. Khaaneph did not, could not work together before the Rak’Shiir . Does a Gaalsien God exist, perhaps? It seems likely, likely that the Gaalsien have a God that helps His people, and unites them. The Khaaneph do not have a god. God never helped the Khaaneph. Creet’tho crouched, peering into the cavernous hangar bay of the Khaaneph support cruiser. Approximately twenty souls were required to crew a vessel of this size, which meant that nineteen Khaaneph were now lost to the sands. Did the Godless have souls? Such musings made Creet’tho uncomfortable, and for a moment the silence seemed to press in on him from all sides like something tangible and lost, seeking solace from itself in the presence of the living. Then, it was gone, and all that remained was something Creet’tho was intimately familiar with: a damaged ship. What secrets lay inside? Already he’d learned about an incredible piece of technology, the Rakshiir that the Khaaneph used to communicate. But first they had to find one. Creet’tho stood and started back down the slope to where the girl sat. “There’s plenty of room in there, and we’ll be sheltered from the worst if a storm appears suddenly” he said, completing the remainder of his descent in a half slide, half jog. “Khaaneph knows size” she responded that was…my…cruiser”. Creet’tho looked at her for a moment, but replied only “let’s see if we can find your Rakshiir”. “Yes” she agreed “find!”. Creet’tho stood, stretching his back and resting his hands, which had begun to ache again. He and the girl had moved further down the wreck to where he had rescued her yesterday, and had been searching the sand for over an hour. He stared down at the her, observing as she searched intently, sifting the sand on either side of the drag sled. He could see the hope in her eyes, the fervor. Although they searched mostly in silence, he had found out that no other Rakshiir would work for her. Apparently, the device somehow imprinted on the owner when it was attached, and could not be substituted for another. Not even a new one would work; so if she did not find hers, her access to her people was gone forever. If she were to rejoin them without it, she would be ostracized, cast out into the desert to meet her fate, her doom, at the hands of the unforgiving wastes. Alone. Alone was barely used in Khaaneph vocabulary, for they were all one mind, one person. They thought of each other as parts of a whole, not individual entities, each with it’s own thoughts and feelings, wants and wishes. After what he’d learned about her in the past day, he was surprised she was able to function at all. He suspected an individual older than her would have been rendered insane or comatose by her situation, and that the plasticity of youth lent it’s assistance. Hers were a people long feared by the Gaalsien, and it struck Creet’tho that having the mystery behind this…people revealed to him lifted the burden of apprehension and replaced it with an unexpected feeling of sadness. He looked at the girl through his night vision, the image slightly digitally enhanced and magnified. He could see her furrowed brow, her searching eyes, her fervent expression…her desperation. He saw this, and felt sorrow. Sorrow for a mortal enemy, one that destroyed and murdered his Kiith. Sorrow for a soulless people. The sorrow gripped his heart like a fist, slowly squeezing. It caused him to ache in his chest, and his eyes to sting. This was an entire people, created by Sajuuk, the Great Maker in all of his glory, yet they forsook Him, and themselves. They chose, not salvation, not blasphemy, but annihilation; an incomprehensible damnation rather than shelter in the hand of the very deity that had wrought their being from nothing. The nothing from which they were choosing to return. They truly were the Godless, and that tore at Creet’tho. How must it feel to be an all-powerful Creator, yet have your creations spit in your eye, defying the very force that granted them the ability to do so? How noble must the Maker be, to have given such a gift? And how misguided must her people be, to have forsaken such riches? Why? Why?. “So…Maker not provide? Or does provide?”. A half hour had gone by, and Creet’tho was finishing the adjustments made to his personal scanning equipment, hoping to better calibrate them to assist in the search for the Rak’Shiir. He’d been explaining to her the basics of his faith, but she was proving to be a slow study. The Khaaneph language didn’t include words that allowed him to easily convey the concept of divinity, belief, or righteousness. In contrast, her people quite literally believed themselves to be the rightful rulers of the great banded desert, simply because they had defeated or absorbed all of the various Gritiidim factions after the discovery of the Rak’Shiir. While such arrogance was astounding, the belief made sense given the culture created by such a device, which would dramatically hamper alternative perspectives if not eliminate them entirely. Such knowledge of their kind comforted Creet’tho in a way, but did little to assist him with his current conversation. The device, coupled with their history, had created a people with an incredibly skewed perspective of the Creator, but at least they realized He existed. That information was of great comfort to Creet’tho. She had a soul, and he would do what he could do ensure her salvation. “The Maker provides all that there is, and all that there will ever be, small one. Gesturing, he continued “all of this exists because He wills it so. You and I are both alive because of the great Sajuuk. He placed all Kushan on Kharak as punishment for our sins. We must abide by his will, accepting and enduring our trials with humility and grace. As the Great Maker Who’s Hand Shapes What is, He deserves our praise. The Heretics beyond the sands spit in His eye with their misguided attempts to seek the stars, but they at least have great temples dedicated to worship. The Khaaneph…well, the very word means Godless” Creet’tho finished, and, despite the heat, a cold chill ran through him at the concept. “Khaaneph knows!” came the reply. He glanced down away from the sensor screen, and met her gaze through their masks. She wore a small smile and a proud expression “Not know where word came from, but proud, for Khaaneph need no help from your God”. Creet’tho closed his eyes with a small sigh, and reminded himself that patience was the most glorious of virtues. He would not give up on her soul. I am scared. If I don’t find the Rak’Shiir, I can never return to my people, and I will never be Khaaneph again. Or what if I find the Rak’Shiir, but it no longer works? Either way I will be be alone…alone forever. The girl had gone quiet immediately after touting her people’s independence from the Maker, and Creet’tho thought it best to allow her time to ponder what they’d discussed. He too a moment and slowly scanned the sands in silence, trying to understand the unpleasant feeling in his gut. It was a mixture of urgency and something more ominous, as though he were running out of time. No, not him, he realized. Everyone. He had no explanation for it, but he’d felt a sense of foreboding since shortly after leaving the outpost, and it was growing stronger by the hour. A sharp question interrupted his attempts at deciphering the apprehension slowly growing inside of him. As Creet’tho towed the sled up the dune towards the cruiser’s hangar bay opening, his thoughts returned to what he hadn’t told the girl: something was wrong. The feeling sat in his chest like a rock, cold and hard and just as solid. He would be as prepared as he could be. He’d spent over four decades serving his Kiith in the sunblasted land of the Ko’Rhiim, and his instincts had yet to fail him. He would not be caught unaware. End of part 4. Part 5 coming March 2018! I hope you enjoyed this piece! You can read Part 1 here, Part 2 here, and Part 3 here. Also check out my other stories: Reunion, and The Encounter. Art by Julian Schlottmann.